There’s a sliver of sunlight spilling into my room. I’m awake but I lie in silence letting my thoughts filter through me. Observing. Feeling. Letting the day take shape as it wishes. One particular thought takes hold: “I’m not ready to let the world in”. It’s Saturday morning. I stroll around the house. Aimlessly. Pondering the purpose of existence, as one does… as I do; forever and always pondering the deepest most complicated things to which the answers do not exist. A manual maybe, but I obviously didn’t get the memo on where to pick up the manual because I was busy chasing a butterfly or distracted by some intriguing colorful pattern or lost in thought about how nonchalantly nature seems to produce flowers and trees and feed them soil to grow - occupied by the noise of my own thoughts. A friend once described me as having a theme song in my head that my life plays out to - I’m starting to think it true. I’m bored I think to myself. How on earth can I be bored, I have access to an inhouse library, books for days; guitars for days; surfboards for days, everything a possibility for days on end. Mmm, none of those appeal. Nothing. I feel an instant pang of guilt for even allowing myself to be bored, to think of being bored, to think of feeling that I might be bored. SIGH. My brain…I need to switch it off somehow. I breathe. I start the morning ritual. Coffee. Every day is an adventure waiting to happen. That’s the attitude I would like to approach each day with. Some days you love it. Some days are tough. Some days…well some days it’s chaos and equilibrium and war and love and balance and imbalance all in one. You just need to role with it, roll with the punches they say. I get punched lights out when I try roll with the punches, but hey, I’m still here and somehow still standing, so adventure on I do. Life. This crazy place we live on is round. It turns. On an invisible axis. But we don’t fall off it due to something called gravity. So here we are, stuck to a round planet with our feet on the ground, bodies suspended in the atmosphere. Does any of this ever make sense to anyone??? My brain has clearly mastered the skill of micro-thinking. I feel a sense of relief spill over me when my phone lights up the still sparsely sunlit room. It’s adventure time. I’ve always loved the outdoors. It’s a place I can spend hours in on my own and I do. It’s the only place my mind finds solace, peace. Time for solitude without interference, intervention or intrusion. It’s the only place I am calm. I truly think it’s because my thoughts can roam. My mind can ponder all the darkness, all the light, all the unanswered questions. Wide open spaces for it to just off load. It’s got time. An unlimited amount of time for it to just ramble on freely without the confines of the week day grind. Without having to stop and start a thought pattern, without compartmentalizing. Space. Space to think. Think freely. Free thinking. No boxes to fit into, no expectations to meet. I feel balanced. In tune. Capable. Strong. Understood. Liberated. Empowered. Loved. Whole. I make yet another mental note of how to bring these feelings into my every day routine. It’s been raining all day, it’s not letting up any time soon. We’re heading into the forest, to clock some night time hours out on the trails. Most outdoor adventures are solo ones, but night time adventures call for a little back up and that always changes the dynamics slightly. Albeit, I was born for these type of adventures. I was born for adventure. All of us were. Headlamp; spare batteries; waterproof shell; something warm; trail mix; water; electrolyte mix; buff; extra base layer for afterwards. The gear check has become a metaphor for life - without the gear, life can be a pretty rough adventure, come prepared and it’ll still be a rough adventure just one that you can enjoy. Somehow the gear becomes something you can rely on, a consistency to hold onto when heading out into the inconsistent elements of nature. Human nature merging with nature. Some of us can even become a little superstitious about our gear - a certain pair of pants, that shirt, those socks, this buff. Never leaving home without an element of the comfortable enabling us to step into the unknown with confidence. I’m a good trail runner with a strong technical game but when it comes to hills and speed within the confines of my comfort zone I am capable of just enough to satisfy my fickle yet overbearing ego. My mental endurance needs a lot of work. Lately, I’ve been running with a crew of runners stronger, faster and better at the endurance game than I am by far. It’s been great, boundaries are pushed, moving past limits and I am finding my trail legs…even running up hills which I thought were ludicrous to begin with, who does that!? 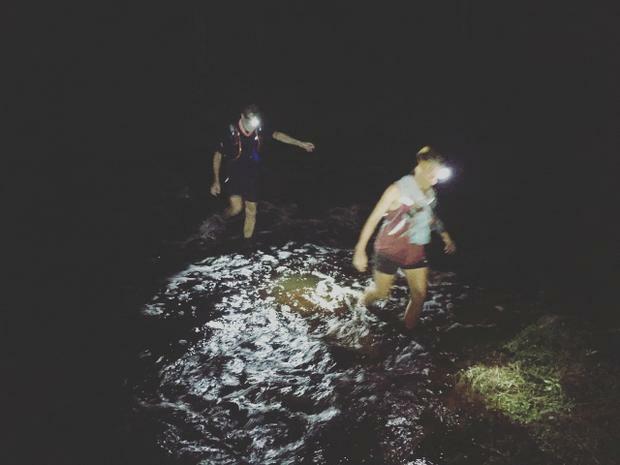 But a daily dose of pushing outside my running and mental comfort zone has left me feeling a little stretched thin and before we set off into the night I could feel this adventure in particular was going to be a tough one. Trust me to do very few things in moderation. I was already striving, already mentally man down. The end goal felt out of reach. I’ve put myself out of the game before it even started. When experienced trail runners say they’re heading out for a night run, easy pace, long distance, what they actually mean is let’s see how far our fast pace can take us and how well our lungs can function at maximum capacity. Also, they rarely walk…at all…ever. I have a lot to learn. Always learning. It’s what I am here to do. My only purpose. Humbled by the realization of my sponge like status, in all aspects of life, we set off. The start of the trail has me struggling to settle into a stride I feel comfortable with. Headlamps flitting through the forest. Mine in particular flopping all over the place. When was the last time I went adventuring at night? So long ago that I didn’t check the straps elasticity. It’s lost most of it and I am running with my headlamp serving no purpose other than a pirate look a like as it shifts to come to rest on my left eye. I feel like a wannabe adventurer. I unclip a part of my bag, reach for my buff, put that on to make the headlamp fit better. Nope, still running with my nose alight and I can’t see a thing. All the while trying to keep up. I can get lost standing still in one place in the day time, imagine me getting lost in the night time while running in the forest - i’ll become the woman who runs with elephants never mind wolves and I’ll never be seen again. Anxiety levels are sky high. After a few failed attempts, I stop. Buff off, clipped back onto backpack. The crew stops. I have to sort out this strap before anything else can happen. We fit the strap around my head, make a knot so that it would stay. I officially feel like the karate kid. Or Rambo. That would depend on the current theme song in my head I suppose. Headlamp sorted. We head off again. The forest is all but quiet. Our foot steps like drum beats adding to the symphony of an already existing song the forest is singing…add my theme song and you have yourself a pretty epic mash up. The rain a welcome relief from the intense humidity that’s hit the Garden Route in a big way. We might as well be living in a tropical rain forest. Summer really is the best time for these types of adventures though- although drenched to the core it’s not cold and body temperatures are set. I admit that I’m one of those superstitous runners. I have a certain pair of pants, socks and shirt that I feel most comfortable in. I try run in those most of the time. It gets especially tricky when you can’t find your favorite shirt on the day you’re heading out into the forest for survival of the fittest camp 101. My brain scrambles. I fail to bring my A-game. When I run with more experienced runners, I need to know that nothing has the potential to distract me from keeping up, running well, getting lost, staying focused. So…there’s method in the madness behind favorite things and it’s that I’ve spent enough time in those pants, socks and shirt to know how they wear in most conditions and that leaves little room for error and means I can perform my best. Most of the time these adventures take you by surprise. At the best of times my thought pattern takes me by surprise. I really need to look into that. I’ve been making steady progress. My running has definitely improved but this evening, there’s a ping pong match going on in my head and I’m struggling to keep up. My brain is the reason my legs won’t work! I stop for a moment and address the chaos in my head. I ask myself what it is I am desperately trying to prove, what am I trying to achieve, why am I striving? Why am I even here!? Oh goodness…here we go again, the unanswerable questions. The last time I checked you were here to run. So..run. Mental health is a serious commitment. One of the most important commitments of my life time. Probably the most important. Commit to your own mental health and you commit to a life of awakening to riches that no materialistic, tangible thing will ever be able to gift you with. These adventures mirror this clearly. I adventure so that my thoughts can roam but I also adventure so that I can come to know the chinks in my armor, come to understand my way of thinking, functioning, living. To learn how to channel negativity into something with a positive outcome and to not only stay sane but make sure I take responsibility for my own mental health that breeds emotional well being for the sake of others sanity. Take responsibility. I run to give myself time to understand where my darkness comes from and how to balance it out with all the light that is ripe for the picking in all of us. Access it. To spend time on getting to know my weaknesses away from the pressures of the day. To love those weaknesses and myself included. Face them squarely in the eyes. Honor them, celebrate them. Nature will show you up for who you really are, but at the same time show you who you are capable of being. I settle into a good pace, my own. I come into my own. I start listening to the sounds that give away the crews location and every now and again look up to follow their headlamp flits through the trees and occasionally reflecting the droplets of rain lit up by light caught within. I am now on my own adventure with guidance never out of reach. My guidance is within. I am capable. I am strong. I am found. I move from a place of striving, pulling myself towards myself, to a place of calm, in sync. My journey becomes instinctual and I can trust myself. Now I am running. I was born to run. Born to adventure. Explore. Discover and commit myself wholeheartedly to it. To discovery. To discovery of self. If that is the only thing I do in this short and fleeting life, then I have succeeded. That’s why I am here. We cross rivers. We slip and slide down rooted single track. It’s still raining. Time is forgotten and I am enjoying every minute. We all seem to have gone quiet and turn inward. We shared something of ourselves with ourselves and each other. Isn’t that what adventures are for. No ego’s, just souls dancing along to each others theme songs in each of our heads. Acceptance of self and those that love spending time with us. The allowance of our humanness to be the best there is about us. And owning it, every damn day.